Outsource2india provides Medical Transcription Services to hospitals, multi-specialty clinics, physician practices and healthcare institutions. Our global delivery centers, located across India, Philippines, South America and Kenya can process high volume healthcare transcription requirements with great speed and accuracy. Outsource2india assures you over 99% accuracy, less than 24 hour TAT, and competitive pricing. If you are a hospital or a multi-specialty clinic, we can handle your entire medical transcription volume, physician by physician, and submit reports into your system and even fax the reports on your behalf to the referring doctors! 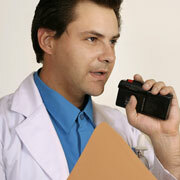 Outsource2india's medical transcription work-flow is 100% HIPAA compliant. In order to ensure consistency in quality, we dedicate medical transcriptionists to each client account. This is done to ensure that they get well acquainted with the style and accent of the dictating physician. Over 99% Quality - Our three-tier work-flow ensures that a quality check is done on each file before submission. The transcriptionists assigned to each client account have ample experience in that particular specialty to ensure that medical terminologies are correctly transcribed. Each transcript from the template to the patient details to the dictation is checked twice for accuracy. 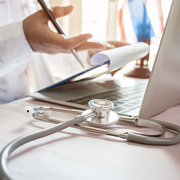 Negligible Error Rate - All transcription work is done by experienced professionals and not by any speech recognition software, to ensure error free transcripts. Read our article which lists the 10 sure shot ways to eliminate medical transcription errors. Less than 24 Hour Turnaround - With delivery centers located in Philippines and India, most of our North American customers benefit from our overnight turnaround time (less than 24 hours). Because of the time advantage, we will ensure that reports are made available to you quicker than ever. 100% HIPAA Compliance - Outsource2india's healthcare processes are 100% HIPAA compliant. Every member of our medical transcription team undergoes regular HIPAA training. Please read HIPAA at O2I for further information on the HIPAA compliance measures that we undertake for security and confidentiality. Experienced Transcription Team - Each medical transcriptionist graduates from a rigorous six month medical transcription course before being inducted into our team. Some of our transcriptionists and proof readers are physiotherapists and therapists who are well acquainted with medical terminologies. Free Trial Offer - Try us before you sign-up with us! We can offer a free trial on a sample project for you, to demonstrate our transcription capabilities. Send us sample transcripts, templates and sample audio files. We helped a group of radiologists save nearly 40% of their operational costs and complete process reports for nearly 2000 patients a month. O2I Processed Over 3000 Encounters Related to Rehabilitation Care for a Group of Physicians from Indianapolis. If you want to know more about outsourcing medical transcription to India, read this article.